Casinos are typically decorated extravagantly, and filled with glitz and glamour. They usually adhere to a variety of possible themes. From the flashy Vegas showbiz theme to a more casual, topical island vacation theme. Casinos typically base their furniture, color scheme and art choice on their chosen theme. We have also seen a trend of casinos moving away from the expected dimly lit lighting and accompaniment of showy décor pieces that are usually associated with a night of gambling with the homage to Casino Royale, to a more modern look. This includes the latest trends in furniture and street art inspired art pieces. The ambiance is very important as it makes the choice of staying in the space, a much easier one if the ambiance is well inviting and well suited. If you are in need of a bit of practice when it comes to the game of chance then visit casino.netbet.co.uk. With anything worth doing, preparation is definitely recommended, so don’t hesitate to hone those skills! I don’t know about you, but when I think of the words “casino” and “art” the image that comes to mind is the Dogs Playing Poker series of paintings by Cassius Marcellus Coolidge, that were also used by Brown & Bigelowto advertise cigars in the early 19th century, as well as the series of oil paintings – 18 paintings in the overall series. These visages of canines sitting around table playing cards have been used many times in popular culture. 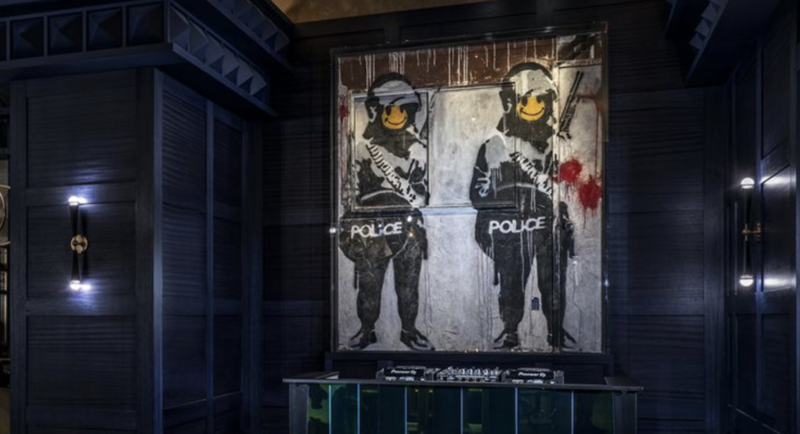 Contrasting the choice of street art used above, the Aria Resort and Casino has a fine art collection that features work by famed artists such as Maya Lin, Jenny Holzer, Frank Stella, Henry Moore, and Richard Long, to name a few. This high-end resort houses an impressive collection of a variety of styles and media that range from sculptures and paintings to larger art installations. These successfully engage visitors in perceptional as well as on conception levels (visually and mentally). Some of these pieces existed and acquired after their creation and carefully selected for their artistic value and cultural significance. While others are location specific installations where the artist made the piece of art to suit their vision of the space. Casino art décor is a growing aspect that many artists seem to have been interested in experimenting with as with the Aria fine art collection and Banksy’s unique brand. It seems that this new category of décor is wide open and free for expression, keen to be molded into a specified type of décor or possibly space where artists of different genres can express themselves according to their vision of the space provided.